If last week’s post was an afternoon’s light hearted frivolity, then this would be pretty much be the opposite. The is one of B’s standards for polishing off an evening or the otherwise somnolent task of digesting a heavy meal. As with a good number of cocktails (drinkers make lousy historians) the origins of the Stinger are obscure. David Wondrich talks about it in both his Esquire Drinks and in Imbibe (his rendition of Jerry Thomas’s Bon Vivant’s Companion). It’s clearly a pre-prohibition ditty that was almost exclusively consumed as an after dinner drink until some time in the 20’s when Reginald Vanderbilt started using them as a lubricant before the meal. Social trendetter that he was, I still can’t see it. The Stinger just has the feel of a nightcap or a digestif. 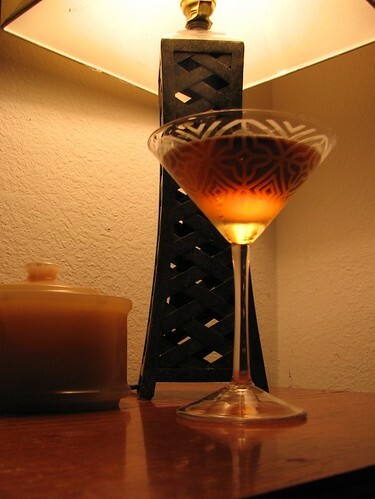 The ratio of Brandy:Creme de Menthe varies. May recipes call for 3:1. Personally we think this is a bit sweet and minty (a la drinking Scope). 5:1 is pretty much a brandy on the rocks (fine, but don’t call it a Stinger), so we have settled on 4:1. Creme de Menthe comes in two varieties, green and white. The green is mostly for Pousse cafes and the like; my mother also claims it to be a popular topping for ice crjueam in the late 60’s at women’s luncheons (she used to teach home ec and would know). White is the clear stuff and what you need for this drink unless you want a really ugly brown/green sludge. Creme de Menthe and Peppermint Schnapps are very different beasts. Even though they are generally made in much the same way, the mint flavor is quite different. The Peppermint Schnapps tends to have a much harsher overpowering mint flavor, so the stinger is pretty much undrinkable when made with Peppermint Schnapps.